Free Printable Certificates of Excellence. 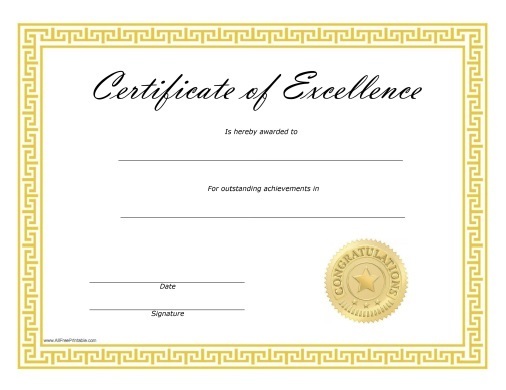 Free Printable Certificates of Excellence great free printables to recognize student achievements. Save money for the graduation with this free printable certificate of excellence and use for a special recognition day or graduation day. Print all the Certificates of Excellence using your laser or inkjet printer at highest quality possible and certificate paper, and present to the students with outstanding achievements. You can select from 3 different designs of Certificates of Excellence. Click the link to download or print the Certificates of Excellence free in PDF format.